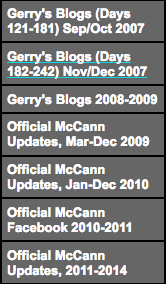 AJS writes: The work that Nigel did in creating and maintaining McCann Files is, of course, well known. That site is simply a gem to anyone who wishes to research the case in either its narrow or broader aspects. Most of the English language primary sources are there as well as a wealth of other stuff but perhaps the most valuable material is potentially the most misused or misunderstood: media reports. Such reports tell us almost nothing of value about the supposed subject being covered but, potentially, a great deal about the people providing the information and why, for little ever goes into a national UK paper without a hidden reason. Until Google it was impossible to track what they were up to. Few wanted to search through giant volumes of essentially shallow thinking in press cuttings libraries sorted by date, not thematically; journalists had long got used to living in a kind of permanent present in which the continuity of (hidden) special interests in their stories was largely unseen and unchallenged. With Google’s help the genius of Nigel changed all that. His long, scroll-like threads followed press reports thematically for days and weeks at a time and suddenly – a revelation, in Mr Redwood’s words – it was all there: with a little practice you could see which group had fed the story originally, how it was added to and developed, which journalists were in the pockets of which PR people, how alternative versions or rebuttals of the original story were handled and so on. It was extraordinary to see a half-century old modus operandi stripped naked in this way, as though the people involved had been bugged at their place of work. And the reality was not pretty: an industry completely infiltrated and corruptly available for hire. His exposure was a clinical Anatomy of the Lie. Nigel’s work in the collation and sequencing of the broadcast media revealed an industry less corrupt financially than the press but open to similar abuse due to the overwhelming power of the image on the screen and its ability to make us suspend or dismiss rational thought. Few people remember the words used in TV news reports: they remember the mood not the boring facts, or absence of them, and this provides a splendid cloak for manipulation, whether for "good" or ill. Who remembers the words to the news item about the drowned refugee child on the beach? The words, all spoken of course in the undertaker's voice that well-fed correspondents can turn on or off like a tap, or in Olga Guerin's case like a faulty fire alarm, didn't matter: it was the picture that ultimately opened the doors to Germany. Such is the power of television. The Dom Pedro Hotel, like Phillip Greene’s vulgar and disgusting gin palace and his McCann-carrying private jet, is now a byword for greed and the style to which the parents became accustomed with others' help. Its notoriety is due largely to one of Nigel’s triumphs: putting together the footage from the numerous media conferences given by Gerry McCann when he returned to Portugal and allowing viewers to draw their own conclusions. It remains genuinely shocking to this day: the deception, the shamelessness, the outright lying to the Portuguese public, time and again, about the reasons for his presence in the country. And in there also is Mitchell, stating that staying in a luxury hotel (while secretly consulting his libel lawyer) was a justified use of the money donated to that wretched fund. Yep, Gerry McCann was entitled to the money because he was “searching” while staying in the Dom Pedro. Where, under the f*****g bed? Such are Nigel’s innovations and they remain as relevant today, perhaps even more so, than when he developed them. Our friends the City correspondents, the sort of people who enriched Piers Morgan by using the media to illicitly increase share prices, for example, hardly need reminding that the Nigel Moore method works well with them too. As many will be aware he’s had a tough life and some harrowing personal tragedies. Yet you wouldn’t know it when communicating with him about this case: in all the time I knew him he radiated balance, fairness and a sense of proportion. I never knew him to be openly hostile to the McCann pair. Often, when I’d written something that I thought might be too strong I sent it to him for his opinion and was rewarded with his calm analysis. He was, indeed, the first person I’d occasionally allow to edit my work in decades and I always agreed with his suggestions. In my experience he was trusted by everyone involved with the case who dealt with him and - a considerable rarity, this - as much in Portugal as in the UK, from GA down. I never knew him to breach anyone’s confidence. He had no front to him, no desire to impress or big himself up. About the snakepit side of the affair – when that black-toothed and poisonous crone BB, for example, stated repeatedly that “everyone knew” that the commentator Dr Roberts was actually him, which of course was deliberately calculated to make people distrust him – he shrugged it off. When a couple of crooks tried to take over McCann Files he got rid of them and later described the episode with weary amusement. To those who think that this might be an idealised portrait I can only reply that I write about him as I saw him and hope to see him again. Any fears among the less realistic of our readers that he dropped out under intimidation are groundless: Nigel was sensible enough not to libel and was pretty impervious to pressure. Over the past few years, though, he found it a burden to keep up such a high maintenance site while dealing with a sea of troubles; appealing for funds for the site was something he dreaded, which is why when the appeals did come they were late and hesitant, as though he felt he was imposing. He is uninterested in money. FWIW, over the past eighteen months or so he found the flight into unreality that appeared to have overtaken case comment troubling and expressed his dissatisfaction vigorously. It is one of life's typical and bitter ironies that, having provided the tools to research the case properly, he watched them being ignored in favour of assertion and fantasy. Although Brenda Leyland was a Bureau reader, and a complimentary one, I never had any relationship with her and therefore knew nothing about her personality from close up. Yet it is the sense of appalled sadness I felt at her death, and the unspeakable treatment of her by the media, that springs to mind whenever I think of Nigel and his long travails. He too was targeted by the (fed and prompted) media and he too has paid a price for what he did. But it’s something deeper than that.